I didn’t get much time to play since i last posted- nonetheless, a lot has happened in that timeframe. Our small guild meets up around a loose weekly/bi-weekly schedule to do stuff together. As many of us are “time-casuals”, these meet-ups might be the only time to log in and see others being online. Before we got our first new recruits, we would just continue our Daggerfall Covenant group, but as that group is full, that isn’t an option if we want to invite the new members along. 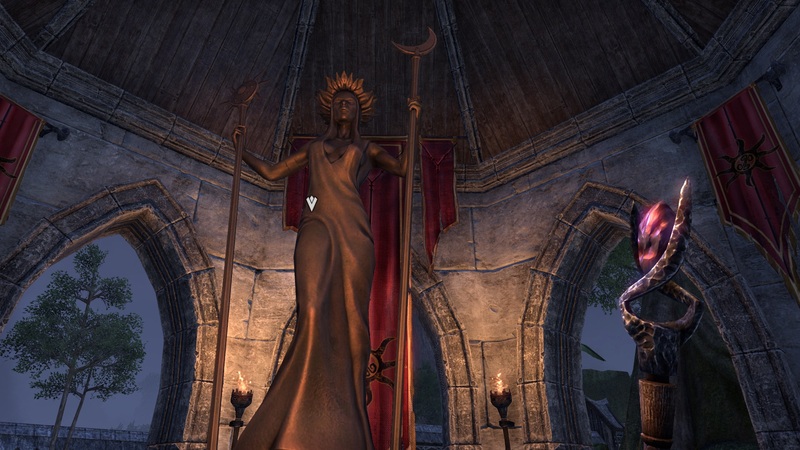 Since we were already eyeing Cyrodiil, we decided that it was time to put our swords in service of the Aldmeri Dominion. Of course, we’re PvE players, mostly. So running out of our gates to chase down enemies wasn’t really an option. 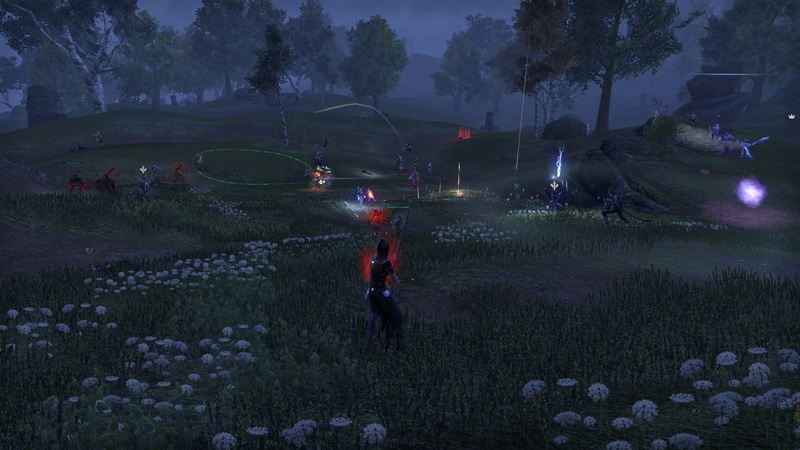 But Cyrodiil has us covered- there’s much to do there for PvE players, as well. At least if you’re willing to take the chance of being attacked by other factions’ players. 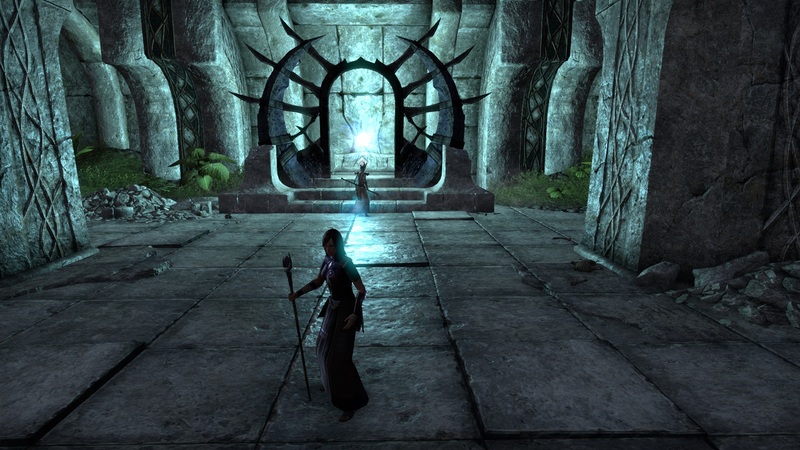 There are skyshards, open dungeons, Dolmen, even PvE-quests to be found and completed. And i have to say that we had a great experience. As i usually do, i decided to go in mostly unprepared, without doing much research but with just enough knowledge to get us going. So i searched for a village in a seemingly safe area of Cyrodiil, found one and memorized the general direction we’d need to take to get there. I chose Vlastarus and a northwest direction from where we’d spawn in Cyrodiil. Taking this approach made the evening an event to remember- at least for me. 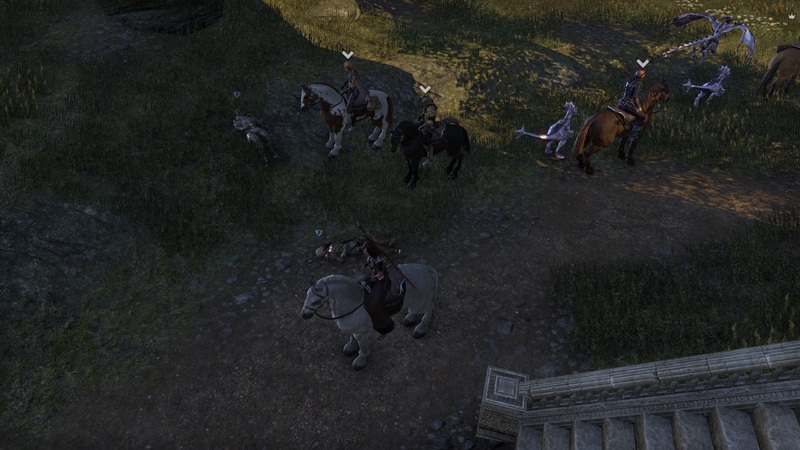 The moment we spawned in Cyrodiil, i felt “free”. Yes, i had a general idea of direction, but we had no goal other than explore, see what the landscape offers, and having fun. So we took out and explored. When a landmark looked interesting enough, we went there- there might be a skyshard, a dungeon, a lore-book or something else worth discovering, after all. We fought some npc’s, opened heavy sacks, took a look and went on in our business. What lies inside, i wonder? I didn’t have the impression of Cyrodiil being an extraordinary big zone- it’s big, but it wasn’t awe-inspiring. There’s a difference, though, to the usual PvE zones i explored so far: the landscape is open- there aren’t many mountains to guide your passage, basically you can go wherever you want to go. And then, there’s that sense of danger- after all, it could happen that a group of enemy players found their way into the same area we were in. So turning around and taking a look was a good idea. I really liked that combination- the vague sense of danger, direction and a goal, later on even tackling (PvE-)quests combined with the freedom to basically go everywhere we liked and do whatever we liked to do. We were in good company and had a really nice evening- and i even managed to level up once. In the village, we were attacked by two other players- while i’m pretty sure we would’ve engaged them on sight, we didn’t see them first- they attacked us. When it was time to call it a night i saw there was a siege going on close by- maybe it was bloodlust taking over, but after that evening, i wanted to take a look at a larger-scale fight. I wasn’t disappointed- Siege in Cyrodiil. The castle’s behind that rock on the right. Now, Sieges are a very different matter- it’s chaotic, there are many stronger enemies fighting and attacking you, health is going down rapidly and when you want to join up with the force after respawning, there might be stealthed players waiting for you. It went a bit chaotic there, but since it was the last thing we did that evening, it was ok. Sieges are great, but they need a different skillset- for the player and maybe for the character, as well. With my light armor, i was lying on the ground in a heartbeat. Anyway, Cyrodiil was great fun- in a group even more so, but i’m sure i’ll revisit it solo, as well. It’s open, it’s free and very lucrative, especially in terms of crafting materials- each sack i opened contained 20 items of some resource. 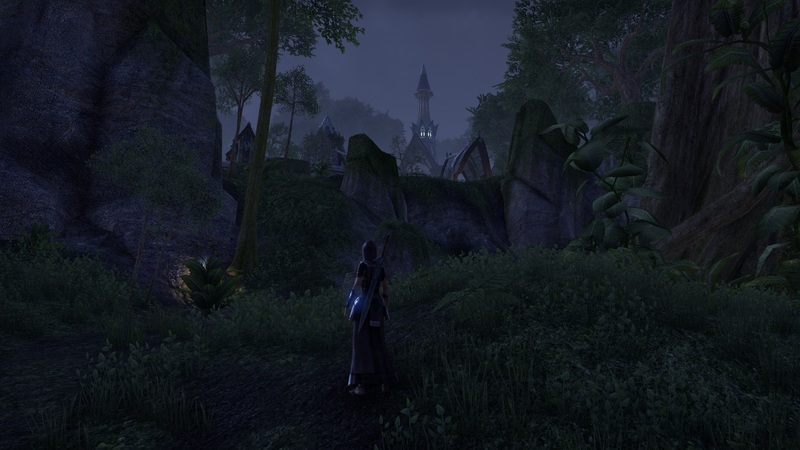 Other than that evening with the guild, i’ve only had one chance to play and tackled only one quest- to free Culanwe from her prison in Coldharbor and see if that beacon would turn red. Taking in the view to Laeloria. Well, it didn’t. Although the quest surely didn’t disappoint me and it might have had a different ending if i had chosen to kill that winged demon. 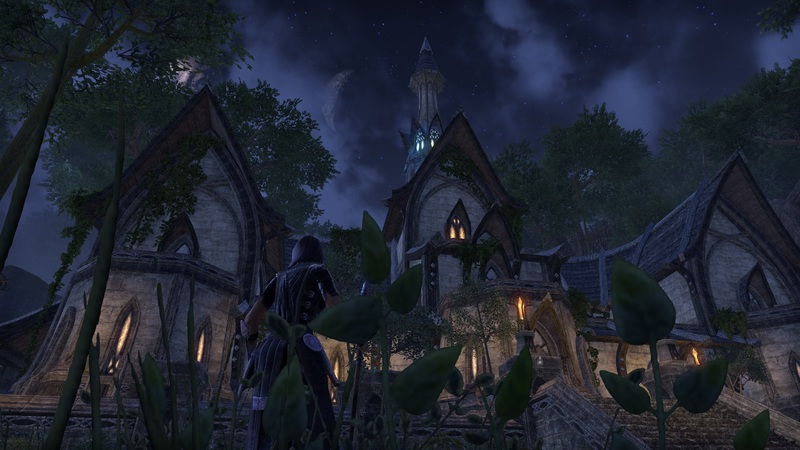 These ruins in Elder Scrolls Online still baffle me- i mean, they often resemble each other in internal and external design and look and it’s mostly sidemissions that lead you in, but for some reason i can’t put my finger on, in ESO i’m interested. Maybe it’s just plain luck that the ingame-time of day corresponds very well with the feelings i have regarding some of those quests. For instance, the Laeloria quest seemed mysterious to me. There’s nothing really special about some woman being held captive in some place or a cursed building containing a gate to the underworld. Well, at least this isn’t something special in MMO-land. But here, beginning with the quest-giver in that tree-house, everything set the mood in just the right ways. The whole time i could see Laeloria- i went past it a few times already, but i couldn’t see it in its entirety. There was always that tower looming, though, and i was really excited to explore that place even before i got the quest to go there. Add to that the story of the imprisoned woman, Culanwe, suffering for a hundred years or longer, in that same prison we, the players, escaped in the tutorial, and suddenly i was game. There’s even a Daedra involved. So in i went, in the night, to fight some demons and gain access, first to the basement of that place, then via portal to Coldharbour, to free a woman in a pretty unimportant (i guess) side-quest. And i loved every minute of that experience. Atmosphere and immersion- it’s been a long time! The whole thing took me about an hour to complete. Again, this is one side-quest. But for now, this serves as some kind of iconic place and quest for me, incorporating all the things i really appreciate in ESO right now. Next Article TSW’s Grand Master pack: still worth it? Hehe, we had no choice. Also, it was kind of their own fault, two of them attacking five people. I know there’ll be better quests than Laeloria, better stories- but really, experiencing this was like seeing all the things i love in that game right now in a single side mission. 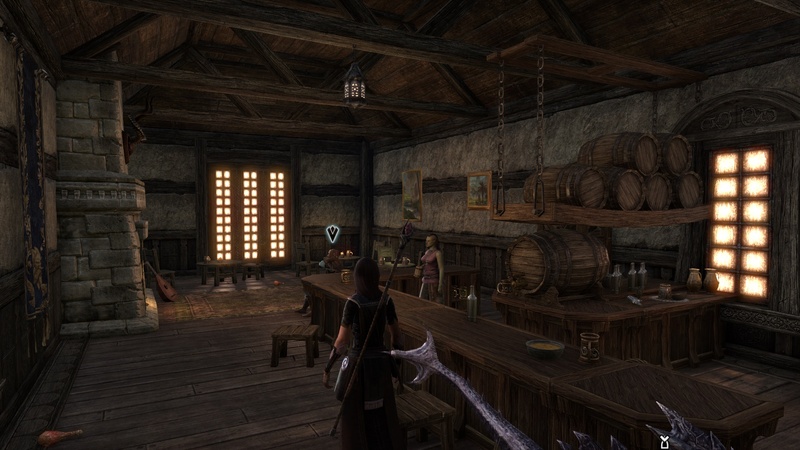 Adding that experience of freedom in Cyrodiil i’m in a really happy place right now.